There is nothing like a nice trail run. In the urban city, (Des Moines is urban, right?) the pounding on the concrete and asphalt streets, sidewalks, and bike paths takes its toll on this regular guy runner with a running problem. It feels great to get out to the wooded areas for some trail runs along the lake. John and I ran an easy hour run on the trail. Of course, the topic of Lean Horse dominated the conversation. We discussed, once again, the amount of time it would take me to run a 50 mile race - calculating pace while running is not an easy thing to do. We discussed logistics of drop bags, hydrating, eating, and ipod usage. 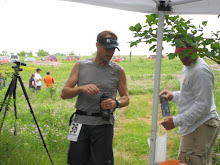 In the two weeks prior to the race, John also reminded me that rest is a good thing, that if you got faster from running, your speed would actually increase on your long run. We discussed that we need to quite our full time jobs and somehow see if we could make running our full time jobs. We thought we could do clinical trials regarding hydrating, but than John brought up the fact that it only take one clinical trial "fail" to have serious consequences, like not breathing anymore. As we were running and talking, I was thinking to myself, this is why I run. I run to get outside, enjoy the surroundings, and enjoy the company. There is nothing like a trail run.